When it comes to looking after ourselves, mums are the first to put themselves at the bottom of the list of priorities, which is of course understandable when you’re completely responsible for a small human being or two, but if we’re not physically and mentally looked after how can we look after those little ones. Don’t get me wrong, I’m not going to say that simply by using a moisturiser all your problems will be solved but, for me, if I’m organised and on it with the routine, I’m a less shouty mama. If I can still take care of my skin, hair and body without it using up time I need to spend reminding the children to put on their socks, shoes, coats… then I will. I’m sure I don’t speak only for myself when I say that if I feel good inside and out, I’m a happier mummy to my girls. 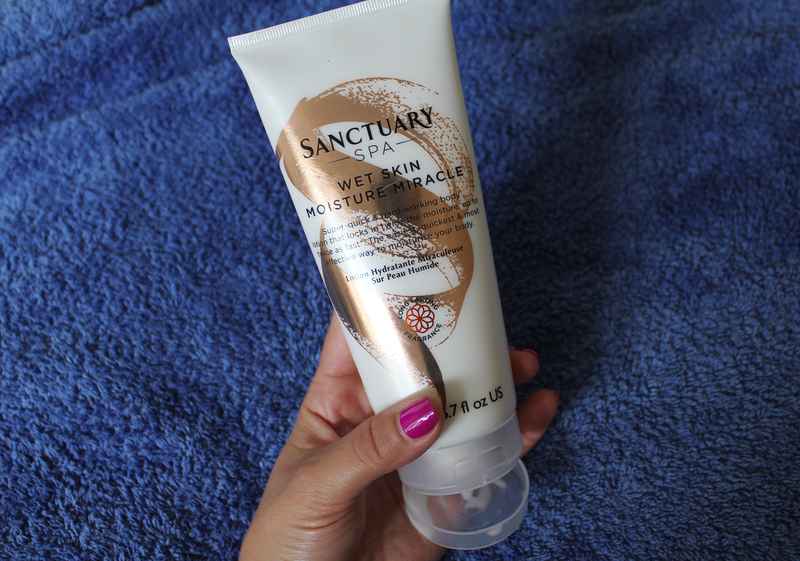 So (yes, here’s where the moisturiser comes in!) feeling confident that I can throw on a dress and heels and get my girls out of the door to school without then looking down at my legs en route to work realising my skin’s dry and in need of moisture, is important, actually. Admittedly in my work as a Personal Stylist this may be more of a shock horror moment for me as I go to people’s houses and advise them on their style; if I can’t look polished top-to-toe, how can I promise them they can be too. But I do know that from styling women, the condition of their skin, hair and nails are a total confidence thing. 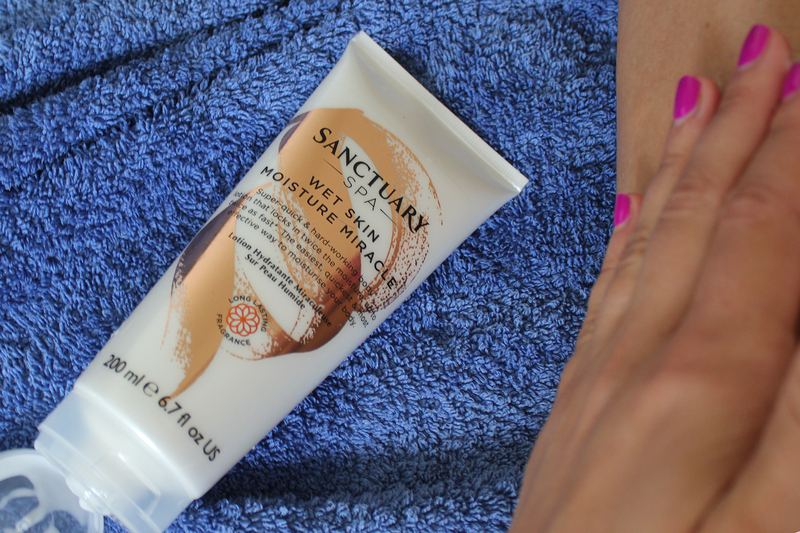 The good news for all those of us who think we don’t have time or simply forget to moisturise our bodies, is that there is a solution in the form of the new Wet Skin Moisture Miracle from Sanctuary. The difference is, you keep the tube in the shower and apply to wet skin once you’ve finished showering. Then get out, then towel dry. 1. After finishing your shower, turn off the water and reach for your Wet Skin Moisture Miracle. 1. I dislike being wet. Yes, I love a hot shower, but it’s the bit between turning off the shower and being fully dry that I don’t like (I’m hoping this isn’t just me and toddlers who moan they’re cold post-bath!). 2. I couldn’t believe that the moisturiser would stay on while towel drying my skin. Surely it would just get wiped off and I’d be left with a messy towel? I’m both surprised and pleased to write that it actually does work! No messy towel, just moisturised skin which smelled good all day and stayed moisturised all day – even while wearing jeans. Is there anything worse than dry, flaky skin when you peel off your jeans?! It’s not too thick so it’s easy to apply quickly and evenly and you don’t need to use a huge amount; I love using body butters but I do feel like I scoop out half the pot to smother it on at speed. 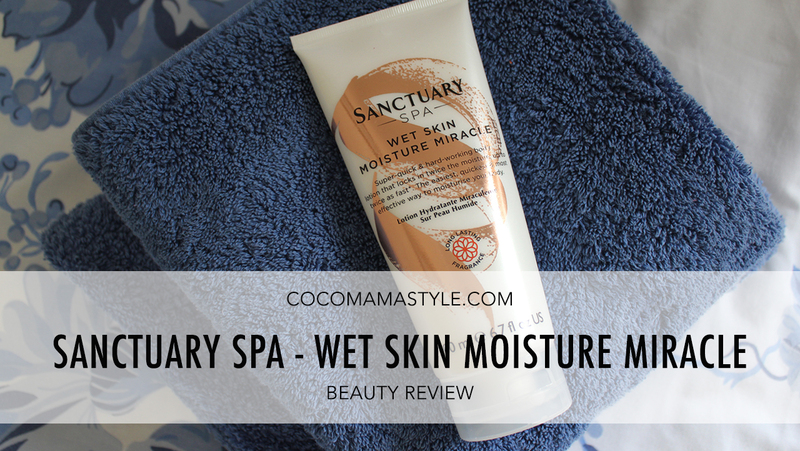 This however glides on, and even with thorough towel drying – I wanted to put it to the test properly! – it didn’t wipe off nor did it feel greasy. 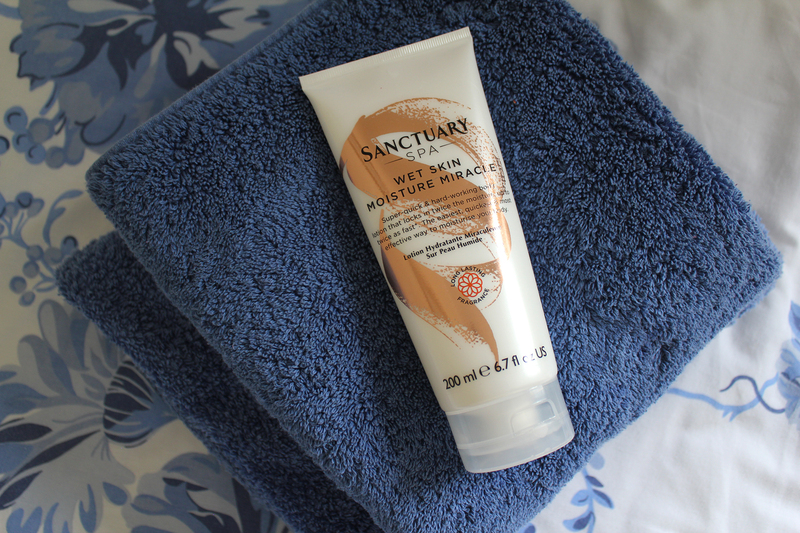 I still need to speed up my application to minimise the ‘post-shower wet stage’ I have issues with but it does eliminate the usual stage after drying where I’m cold and sticky from frantically applying too much body butter and have to wait before getting dressed.